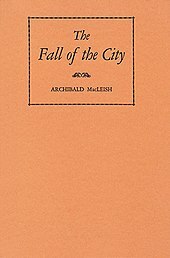 The Fall of the City, Archibald MacLeish's verse play for radio, was published by Farrar & Rinehart following its Columbia Workshop premiere on April 11, 1937. The Columbia Workshop gave authors, directors, sound engineers and composers many opportunities to experiment with the use of sound as a device for enhancing narrative. Buck Rogers was broadcast from a 21st-floor studio that had been troubled with air conditioning noises. At a bend in a duct the air gave a whoosh that had been difficult to dampen. Later, when it became necessary to suggest a rocket traveling through outer space, someone remembered the duct and put a microphone in the bend. Whenever Buck Rogers was on the move, the microphone was opened, producing the sound of a spaceship. This was the first development in sound filters. Filters developed upon the need for radio directors to find a way to portray a voice over the telephone. The filters were generally small boxes through which a microphone circuit could be shunted. The box had dials on its surface. Its inner mechanism could remove upper or lower tones or a combination of them to give an incomplete reproduction, as given by a telephone. The dials allowed the engineer to vary the effect, creating varieties of incompleteness. It became common for radio personnel to play around with the filters to find new sounds, and then having radio shows based upon their discoveries. Many of the staff who worked on the Columbia Workshop would continue with CBS and work for television. The Columbia Workshop received a 1946 Peabody Award for Outstanding Entertainment in Drama. This is a list of all the Columbia Workshop programs, giving known information about authors, adaptors, directors/producers, composers. Occasional remarks have been included. Gaps in dates usually refer to programs that were pre-empted. Information for the years 1942-43 is difficult to come by. May 9, 1937 Supply and Demand Irwin Shaw - Irving Reis Bernard Herrmann Worthington Minor, "director of dialogue and staging"
April 3, 1939 Rendezvous with Kit Carson correct date? 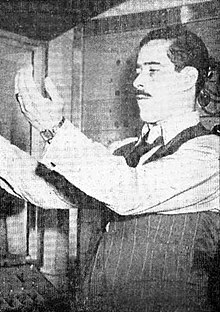 March 14, 1940 Three Original Playlets by KNX staff Writing, acting, producinto and music has been placed in the hands of elevator operators, ushers, stenographers, tourist guides, receptionists, mail clerks and other employed in the non-glamorous jobs connected with radio. Coulter, Douglas, editor. Columbia Workshop Plays: Fourteen Radio Dramas. New York, London: Whittlesey House, McGraw-Hill Book Company, 1939. Kosovsky, Robert. Bernard Herrmann's Radio Music for the Columbia Workshop. Ph.D. dissertation, Graduate Center, City University of New York, 2000. McGill, Earle. Radio Directing. New York: McGraw-Hill Co., 1940. Wylie, Max. Radio Writing. New York: Farrar and Rinehart, 1939. ^ Reis, Irving. Excerpt from script of the Columbia Workshop premiere broadcast. ^ As announced on the show of December 12, 1936. ^ The suggestion is made by the announcer at the end of the Melodrams show of May 14, 1938, but it never took place. ^ Barnouw, Erik (1969). The Golden Web: A History Broadcasting in the United States, p. 65. ^ This list is drawn from a variety of sources, in particular the catalog of the Paley Center, and many old time radio lists. This page was last edited on 16 December 2018, at 21:04 (UTC).